Although not as widely marketed as some other electronics and home appliances brands, Whynter wine coolers are associated with an air of exclusivity, innovation and quality. 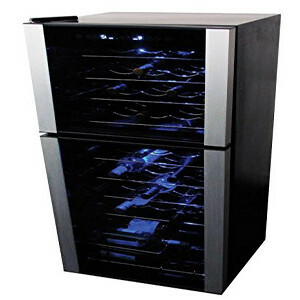 This particular Whynter 20 Bottle Wine Cooler review (with Black Tinted Mirror Glass Door) dissects yet another one of the manufacturer’s premium offerings. Find out how countertop storage can sometimes edge past the usual 18 bottle capacity with the full details of this thermoelectric unit. With regards to the design of this 20 bottle cooler, things are taken to the next level. If we owned a yacht or something to that tune, this would be the perfect wine cooler to chill some of our expensive vintages in. Yes, it’s that classy and good-looking, reeking of the type of luxury that belongs on a billionaire’s yacht. It’ll probably look just as good in your home, office or den though, making for the ultimate entertainer’s dream. Your fellow wine-loving friends will be jealous and wonder how much you spent on this premium-looking wine cooler. The cooler’s collective focal point draws the eye to five luxurious-looking shelves which are trimmed with stainless steel, barely visible through the tinted, black mirror glass on the door. Switch on the interior LED light and it softly bounces off the curves of the stainless steel racks to add even more luxurious sophistication to the black cabinet’s appearance. The cooler radiates a very nice glow and adds premium luxury to any surrounding area it’s placed in. This 20-bottle capacity countertop/freestanding wine cooler has a single cooling zone and it uses thermoelectric cooling technology. Weighing in at 33 lbs, this cooler takes up a volume equal to 22” (H) x 16” (W) x 20.5” (D). You get a one-year limited warranty with you purchase, which is reassuring despite the fact that the cooler is quite solidly built (the air circulation fans are the only real movable parts which could be fragile). A tinted mirror obscures light for a great design effect but it also protects your wines by filtering out UV rays. Accurate and intuitive temperature control is achieved through the use of the digital control unit (soft-touch). This countertop or freestanding use cooler has a good temperature range of 46 to 65 degrees Fahrenheit and is extremely easy to use. If you have some bigger bottles to store, they’re best kept right at the bottom of the cooling compartment, but the inclusion of bigger sized bottles will then naturally bring down the 20-bottle capacity slightly. Since the temperature range covers all wine varieties, you can store either of your wines at their optimal temperatures for decanting, or you can set the temperature to about 56 degrees if you just want to preserve all your wines at a safe storage temperature. The temperature is easily monitored and controlled by using the conveniently located digital control/display unit, with a reassuring beep going off each time you adjust the temperature up or down. It’s a nice touch to have an on/off light switch so that the illuminated display of your collection is at your discretion. Being a lightweight cooler that also uses thermoelectric cooling technology, this cooler not only saves a lot on its power usage, but is also truly a wine cooler that fits into the lifestyle of a real wine enthusiast. You can quite easily move it around and perhaps place it in a boat should the need arise. It operates very quietly too and you can hardly hear it; you’ll have to consciously listen very careful to hear it even when it periodically cycles on. Since this is naturally a cooler you’d want to move around a lot (it looks too good to be permanently used in just one place), before powering it back up you should let it stand for a while. On first use it takes a couple of hours to hit the set temperature, otherwise, after being slightly moved around you can let it stand unplugged for about 30-45 minutes (even though it is indeed thermoelectric cooled). The cooler otherwise holds your set temperature very well with no eyebrow-raising fluctuations to speak of. It’s also quite surprising just how little heat it dispels out of the air vent units, but it does need some clearing space for ventilation nonetheless. We couldn’t decide whether or not this is a pro or a con, but every time you hit the up/down temperature adjustment arrows the cooler gives off a beep. This is perhaps a good thing because it sort of lets you know that you’ve successfully managed to adjust the temperature, but at the same time it might come across as being a bit unnecessary because you can see the temperature by looking at the display. 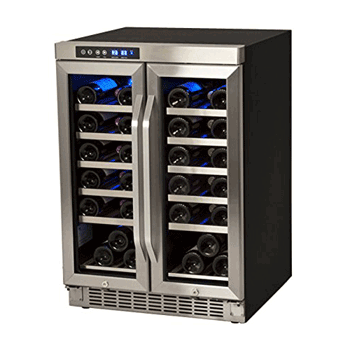 This is a very good looking freestanding or countertop wine cooler with a capacity somewhere in between the usual increments of 18 and then 24 bottles. There is quite a bit to take away from our Whynter 20 Bottle Wine cooler review, not least of which is the fact that this is perhaps a countertop cooler with the biggest capacity around. It may house 20 bottles, but it’s still nice and compact in its profile. 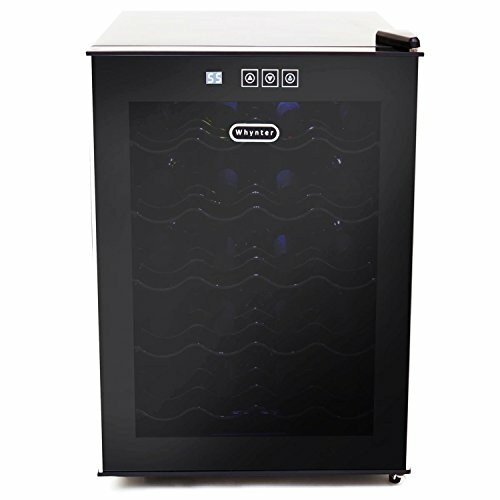 You’ll have very little trouble fitting in some of your Pinot Noirs too and, taking into account the capacity and all the features this wine cooler packs, you might find yourself wondering how you managed as a growing wine enthusiast without it.